Service for shipments with guaranteed capacity and delivery. Practically anything can be sent as priority cargo. 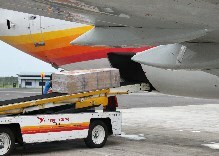 Surinam Airways cargo offers a reliable transportation of your priority cargo to and from all its destinations and beyond with other carriers or by trucking companies. This service is available in all our stations. The space will be guaranteed, if bookings are made within 48 hours prior to Latest Acceptance Time (LAT). Bookings can take place at any Surinam Airways reservation office near you or at any authorized Surinam Airways cargo agent.